Jul 12, by Sandra M.
Yes I would and have recommended Ferretts Iron tablets. They work well, with no constipation. I have been anemic my whole life, and I'm also a long-distance runner. The Ferretts supplements actually work to consistently keep my iron count up to where I can regularly donate at the blood bank. I take 3 tablets a day, and couldn't be happier with the results. Feb 22, by H. B. My doctor told me to get Ferretts because I would only need to take one tablet per day and it would be gentle on my stomach, he was right. Ferretts is much better than the other brand I was taking. 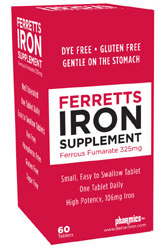 Feb 22, 2012 by Lyn C.
As a gastric bypass patient who needs to take an iron supplement, I was so happy to discover Ferretts! It is the first iron supplement I've found that doesn't bother my stomach, and the very small coated pill size is a huge plus. Thanks for making such a great product! I would definitely recommend it to a friend! Yes, I would recommend Ferretts to a friend. I've been taking Ferretts for about 6 years. I had severe anemia, almost died from it. My doctor recommended Ferretts and I faithfully take 3 tabs every day (on advice of my doc). It's helped quite a bit. Feb 22, by G. W.
Yes, I would recommend Ferretts to a friend, Great stuff...been taking it for years. Best bariatric iron supplement I have found. Feb 22, by Joy L.
Yes, I would recommend Ferretts to a friend. I have been purchasing Ferretts #60 tablets for quite a while now and am happy with the product and with the service I've received from Pharmics. The Ferretts is a medical necessity for me and works well for me. I was glad to be able to find Pharmics on the internet and I am a satisfied customer.